My Best of Both Worlds is pleased to bring readers the Beat the Mommy Blues Giveaway Event! Randi from A Lucky Ladybug and A Ladybug on the Go coordinated this Beat the Mommy Blues Giveaway. Blue Steel is a company that makes unique pieces of jewelry. Their motto is: Wear it. Feel it. Love it. Wishing you all good luck!! “Be on cloud 9 with this floating heart set. It features sterling silver small heart post earrings and a sterling silver floating heart necklace.” This will make for the perfect Mother’s Day Gift for Mom’s of any kind! 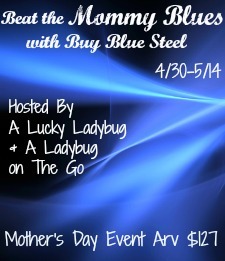 Treat your special MOMMY with the BLUES!! “Make Our Own Network” solely organized this event and My Best of Both Worlds received no compensation for this publication. My opinions are 100% my own and may differ from your own or even those stated in this post. My Best of Both Worlds is not responsible for sponsor prize shipment.